A broken jaw (or mandible fracture) is a common facial injury. Only the nose is broken more frequently. A broken jaw is the 10th most common fractured bone in the human body. Fractures (breaks in the bone) are generally the result of a direct force or trauma to the jawbone (mandible). A dislocated jawbone means that the temporomandibular joint (where the jaw connects with the skull) is moved out of place. The jawbone may or may not be fractured, but even if there is no fracture, symptoms (listed below) may be similar to a jawbone fracture. Temporomandibular joint (TMJ) dislocation and syndrome is a topic of another article. Simple or closed: The fracture did not cause a break in the skin or mucosa or periodontal membrane. There is no connection between the jawbone and the environment. Compound or open: The jawbone is open to the environment. Comminuted: The jawbone region has bone splinters or crushed bone. Greenstick: One section of the jawbone is fractured while the other part is bent. Impacted: One section of bone is driven by force into another section. Consequently, linking the anatomical region with the fracture type describes the fracture of the jaw (for example, a comminuted compound fracture of the body and alveolus of the mandible). Men are about three times more likely than women to sustain a broken jaw. Those aged from about 20-30 years are the most common group affected. About 42% of jawbone fractures occur only on one side of the jaw. A large percentage of patients with jawbone fractures had associated injuries to one or more of the following: head, neck, face, eyes, and nose. Before the 19th century, most jaw fractures were treated with external wraps and healing was poor, infections were frequent, and realignment of the jawbone to facilitate normal positions of the teeth was infrequently accomplished. The normal stresses on the jawbone generated by chewing food did not aid fracture healing and many people died from poor or no adequate treatment. In the late 1880s, stabilization of the jawbone with bars, plates, and screws was begun. Jawbone stabilization has been further refined over the subsequent years to include rigid fixation with proper tooth alignment by open reduction with plate and screw fixation, although occasionally variations in the procedure may be done. 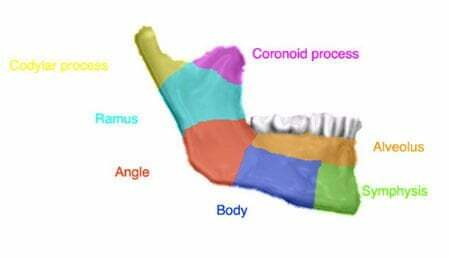 The majority of mandibular (jawbone) fractures occur in young adult males (20-30 years of age), with most occurring in the body, condyle, and angle areas of the jawbone. In the majority of patients, the signs and symptoms of a jawbone fracture begin to develop immediately after some trauma to the jaw. The most common symptom	is jaw pain. People may feel that your teeth do not fit together correctly (this is called a malocclusion). They may be unable to open their jaw all the way, have problems speaking or chewing food, or notice swelling or displacement of the jaw. The chin or lower lip may be numb	because of damage to a nerve that runs through the mandible. Inside the mouth, bleeding or change in the normal lineup of teeth or both can be signs of a broken jaw. There might also be bruising under the tongue or even a cut in the ear canal due to movement backward of the broken jawbone. Drooling and the inability to close the mouth may occur. If after some trauma to the jaw or face, a person's teeth don't fit together correctly, if they have bleeding within the mouth, significant pain, problems speaking, or swelling, they should seek medical care. Broken jaw is best evaluated at a hospital. Therefore, most doctors will advise the person to go to an emergency department, preferably at a large hospital that would be more likely to have specialists (oral surgeons) on call to help evaluate and treat the individual if needed. A potential but serious consequence of jaw fractures is a problem breathing due to loss of support to the tongue. Therefore, any signs of breathing problems need to be addressed immediately by calling 911. A doctor will conduct a physical exam and order X-rays if indicated. No blood tests are needed unless there are underlying health problems suspected that may have played a role in the trauma (for example, falls due to medical problems) or if you need to go to the operating room to have the fracture fixed. The physical examination would consist of a general inspection of the face for obvious deformity, bruising, or swelling. The next step would begin with feeling the jawbone through the skin. The doctor will check the movement of the mandible. Once the external exam is complete, the doctor will check inside the mouth. Patients will be asked to bite down, and their teeth will be assessed for alignment. The doctor will check the jawbone for stability. With the straight blade test, the doctor may place a tongue blade (tongue depressor, a flat wooden stick) between the upper and lower teeth and evaluate whether the patient can hold the blade in place. The best screening film is the panoramic mandibular X-ray, an X-ray that covers completely around the jawbone. This type of X-ray is not often available in smaller hospitals, so other views are substituted. 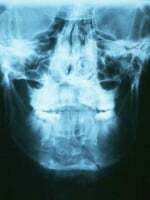 If the initial X-rays are negative, a CT scan	may be indicated if the doctor suspects the patient has a broken jaw but no fractures visible with initial X-rays. If there is any question that an individual may have a broken jaw, they need to follow up with a doctor or a dentist specializing in oral surgery. Ice should be applied to the jaw to help control the swelling on the way to be seen by the doctor. Sometimes patients will need a paper cup to catch the drool or to spit blood into on the trip to the doctor or emergency department. If other injuries are present, if bleeding is brisk or if swelling or other problems may compromise breathing, call 911 for emergent transport. Many people who have jaw pain will not have a jaw fracture and will be treated with pain medications and instructions to eat a soft diet and to follow up with their doctor. Those people with fractures require further evaluation. Many fractures of the jawbone are associated with gum problems or tissue damage and should be considered open fractures. They will be treated with antibiotics and likely will require surgical intervention or wiring teeth together. People may receive a tetanus shot. Pain should be addressed and managed effectively by the doctor. Many mandible fractures are stable, and the only treatment required is wiring the upper and lower teeth together. This will most commonly be performed by an oral and maxillofacial surgeon. More unstable fractures often require surgery. Surgical methods using plates across the fracture site and screws to attach the plates (or thin perforated bars) to bone may allow some patients to have normal motion of the mandible and to eat shortly after surgery. Many jaw fractures require surgery. Because of that, patients may need to follow up with an oral surgeon. Healing time varies with the type of fracture; in general, the average time to heal a jawbone fracture takes about six weeks. All antibiotics need to be taken as instructed. Follow all recommendations on diet; patients often lose weight while recovering from a jaw fracture because many patients may only be able to swallow pureed or blended foods through a straw if the mandible is wired shut to facilitate healing. The doctor may suggest the patient consult with a dietician to help design a good diet until the jaw heals. Because the most common causes of jaw fractures are the result of motor vehicle accidents and assaults, the best prevention is to drive carefully and choose your friends wisely. A more realistic step that can be taken is wearing protective devices in many types of sporting activities. In addition, those patients who have medical conditions that may lead to falls need to treat those conditions and follow individual recommendations to prevent falls. Depending on the nature and location of the fracture, the fracture may have to be fixed with surgery. Some fractures do not require surgery and are managed best with diet changes and pain control. Some people may need to be admitted to the hospital based on their injury. Although many patients with a jawbone fracture often have temporary problems of eating (chewing) and talking, these complications usually resolve over time (days to weeks) with no further complications with appropriate treatment. However, some patients may suffer more immediate complications of airway blocking, bleeding, and aspiration of food, blood, or fluid into the lungs that can be life-threatening. Some people may develop infections of the jaw or face, malocclusion (misaligned) teeth, or both, especially if the fracture is unstable and treatment is delayed or not appropriate. Poor healing of some fractures may lead to TMJ dislocation. Media file 1: Broken jaw. The dark angular line near the bottom left of the skull (viewer's right) is the fracture. Photo courtesy of Lisa Chan, MD; Department of Emergency Medicine, University of Arizona. Chaudhry, MC, MD, et al. "Mandibular Dislocation." Medscape. Updated: Apr 08, 2016. <http://emedicine.medscape.com/article/1283150-overview>. Laub, DR, MD, et al. "Mandibular Fractures." Medscape. Updated: May 22, 2018. <http://emedicine.medscape.com/article/1283150-overview>. What was the treatment for your broken jaw? What were the symptoms of your broken jaw? What prevention measures do you use to avoid getting broken jaw?